The 43rd Marine Corps Marathon will debut a new way for participants to Beat the Bridge. By now, everyone is familiar with the 14th Street Bridge portion of the MCM course. Runners must reach this essential benchmark located at Mile 21 by 1:15 p.m. in order to continue along the course. Void of spectators, the bridge connects the nation's capital to Arlington and has been portrayed as both, mentally and physically challenging. In an attempt to energize and fuel runners, the MCM will introduce water monsters on the bridge. These 125 gallon dispensers offer multiple spigots for runners to fill their personal water bottles. Cups will not be dispensed at this location. Adding this self-serve water station supports MCM green initiatives and also helps runners through a stretch of the course that had previously been without water from mile marker 19 to just in front of mile 22. 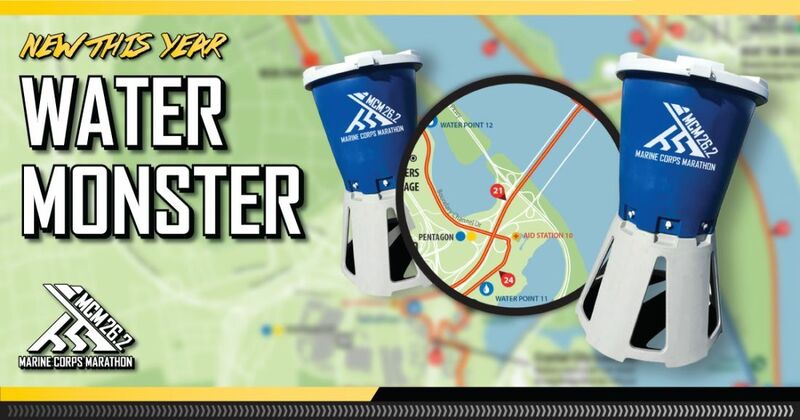 A second water monster dispenser will be located at water point 11 along Long Bridge Drive in Mile 24. This station will offer the eco-friendly self-serve option in addition to the traditional cup distribution. Water great idea! Thanks for visiting this archived blog. The content and details are specific only for the event year highlighted in this article. For current information, please visit the event page within the MCM website.